Posted by Unknown , Monday, April 25, 2011 Be the first to comment! Okay, back to the main point. 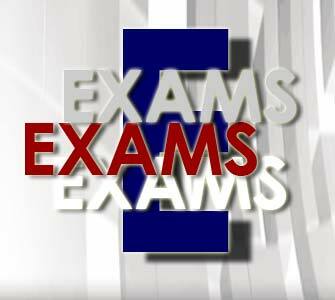 I am having the mid-term exam next week and I don't think I have time to update this blog for the next three weeks. So, I will put the Missing-In-Action tag until the exam is over. EXAM I am coming for you ! Do you hear that???!!! So, a friend of my mom gave 5 of these "bugs" to her. When I first saw it, I was like " what is this? Decoration? " Then, guess what, it was CHOCOLATE. Yup! Bug-like chocolate. From the company's point of view, it has succeeded in attracting the attention of consumers. It is cute, adorable (? ), and looks quite real too! However, from my point of view, I think it is a little bit of wasting. A little chocolate, does it really need to be wrapped in a colourful plastic, and then sticked onto a cardboard? It tastes just like the other chocolates which are packaged into a big plastic bag. Anyway, it looks nice. So, what do we care,huh? Posted by Unknown , Saturday, April 09, 2011 Be the first to comment! Well, I am planning to do a Charizard, and currently printing its templates out, but due to the exam is just around the corner, I don't think there is enough time for me to complete it. So, I am delaying the project for I don't know, 1 month? Maybe 2. But I promise I will make the model as soon as possible ! 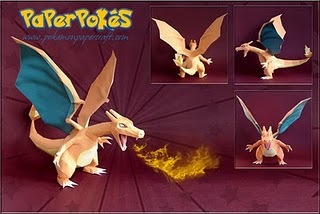 Enjoy the model from pokemonpapercraft.com! Posted by Unknown , Tuesday, April 05, 2011 Be the first to comment! Hello there. I have just finished my cute triple-bonded pokemon, the ultimate honey maker----COMBEE! Don't let those cute faces trick you, it is very tedious to cut and paste the same thing for (OMG) 6 pieces! The side view from right. The side view from left. If you haven't noticed yet, the Combee is sitting above a base. Such a wonderful design by the designers. Posted by Unknown , Monday, March 28, 2011 Be the first to comment! Just came across this simple flash game, and unbelievably, it used me 15 minutes to solve! After numerous attempt to finish my Cacnea, this is the result! Ehhh, wait a minute, it become a real cactus???!!! Oops, my bad. Okay, so now ,time for some funny scenes!!! Cactus: Okay, OUCH, THAT HURTS! OUCH OUCH OUCH, don't hug me so tight!!!!!!! !